Lewis Hamilton (Mercedes) wins the Belgian Grand Prix at Circuit de Spa-Francorchamps, scoring his fifth win in the 2017 Formula One World Championship season. A day after he scored the historic 68th pole position, Hamilton converted his front row start into his 58th F1 victory in a career. Sebastien Vettel (Ferrari) started from P2 and finished in the same position, retaining his championship lead. He has 220 points after 12 races, seven more than Hamilton. Daniel Ricciardo (Red Bull) finished in the third place for the fifth time this season, beating Kimi Raikkonen (Ferrari) and Valtteri Bottas (Mercedes). Other point scorers at Spa are Nico Hulkenberg (Renault), Romain Grosjean (Haas), Felipe Massa (Williams), Esteban Ocon (Force India) and Carlos Sainz Jr (Toro Rosso). Two drivers retired early in the race. Pascal Wehrlein parked his #94 Sauber C36 into garage on lap 3 while Max Verstappen’s #33 Red Bull stopped at Kemmel Straight on lap 8. It’s sixth retirement for Verstappen in 2017. Fernando Alonso was in the game until lap 27, recording his fifth DNF this season. On lap 30, Force India drivers Sergio Perez and Esteban Ocon collided for the second time in the race, causing a Safety Car intervention because of debris on the track. Ocon lost the front wing while Perez suffered rear-right tyre puncture. At the restart, we saw the most exciting moment of the race when Vettel attacked Hamilton, going wheel-to-wheel through the Kemmel Straight to Les Combes chicane. However, Hamilton defended his lead and then again built up an advantage. 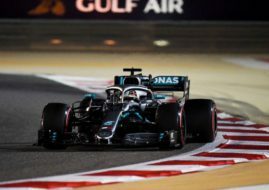 Behind their back, in the same restart, Valtteri Bottas lost two positions under attack of Daniel Ricciardo and Kimi Raikkonen.